My Favourite Film of 1905. My boots were stuck in the sand. Actually they were deeper than the sand. I was in the mud. My boots were stuck in the mud. I tried to pull myself out, but I feel my socks coming loose and the shoe being left behind. I tried to step forward but I couldn't. I look ahead into the distance and see my Dad running madly forward. "That's the sandals lost then." He said. He's only in his socks. We went to Crosby beach today to see "Another Place" or Anthony Gormley's statues. I'd watched the news reports beforehand of teenagers going out too far and getting stuck in the tide, holding onto the figures for dear life. How we'd laughed at the stupidity. So we'd said we wouldn't go out too far. And we hadn't. But that sand looked so stable and I'd stepped forward and plop. I didn't panic. I wasn't actually sinking. But I wasn't going anywhere else. I eventually managed to pull my left foot out, boot and all. But there was nowhere for it to go but backward, back into a squelch as it went back into the soft sand. My plan was to keep doing this until I hit a hard surface. That lasted about thirty seconds when I realised it would require the right foot to move and it wasn't going anywhere. By now my Dad had retrieved his sandals and had trotted back over. I put out my hand and he took it and tried to pull. But he was falling towards me so he stepped back again. I'm glad my Dad's here. I imagined the phone call home if I'd been out on my own "I'm on Crosby beach and I'm stuck in the mud." I'm not very practical -- whenever something happens in the real world, usually with nature, I have no idea what to do. I'll struggle through, but my Dad somehow just knows. I've no common sense whatsoever. "I'm going to have to come out of the boots." I said. I pulled my left foot out, with boot still stuck in the mud. My foot found some more sand to get lost in, but this seemed safer somehow. I turned and tried to pull the orphaned boot out. I eventually had to dig my hands in and pull the thing up from underneath. It was misshapen and caked in dirt, which scattered off as I flung it backwards towards the steady sand behind. Time to do the same with my right foot. I pulled my right foot out, but this time I started sinking. I panicked and dragged myself backwards as quickly as I could, each step slightly easier. I dragged my way up the stand. I turned back. My boot had been left behind. By now I'd decided it was a lost cause. I'd walk all the way back to the station and get the train back into Liverpool in my bare feet if I had to. But before I could say anything, my Dad had jumped forward and was throwing himself into a battle with the sand to the pull the boot up. Now he was knee deep and I'm telling him to leave it or that I'd go back myself, but by now he had both hands in each of the holes I'd left behind trying to find the thing. Dad found the boot. It was sunk a little bit, and by hand he dug a space around it, throwing the mud from side to side until he could pull it free. Dad turned and handed it to me -- it was full of sand and clay which I tried to shake out as best I could. Dad turned and with much more agility than I had, stepped back up to the steady sand. We spent the next half hour using the salt water which had been left behind by the tide in some parts of the beach trying to wash ourselves off as best we could. Somehow, while Dad was getting cleaner and cleaner, I was getting even dirtier. I kept joking about how in some places you'd pay thousands for a treatment like that. I had mud everywhere. It was caked up my jeans, up my legs, up my arms. There was even a spot on my face. He suggested I use my sock as a cloth and this worked. But I wasn't clean, just making space in my skin so that I could move my fingers to blow my nose and throw the hair out my eyes. Eventually we were together enough to walk back up the beach and enjoy the statues. They're an incredible sight, lonely figures looking hopelessly out to sea, unable to move. For those few minutes when I couldn't get my legs to move I knew exactly what that was like. Books During my recent visit to Portobello Road, I stopped in at The Notting Hill Bookshop, the bookshop which appeared in the film Notting Hill. About a quarter of a mile away there's also a cheap gift shop which has the film's logo atop the entrance as well as the phrase "the travel bookshop" which is presumably meant to suggest to tourists that it's there. But The Notting Hill Bookshop has the blue plaque of legitimacy. Either way it was a pleasant surprise to be standing inside the same location as Julia and Hugh from back in the days when Richard Curtis let other people direct is writing. Just a boy, standing in front of a girl, asking her to where the Shakespeare section is. 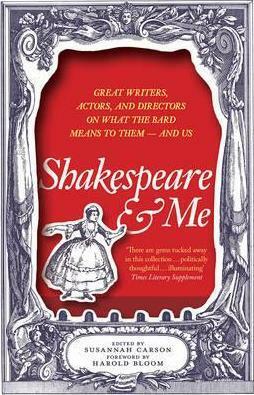 The only book in stock which I hadn't read was Shakespeare & Me, a collection of essay by actors, directors, novelists and academics about what the canon mean to them. There's Camille Paglia on teaching Shakespeare to her students, Ralph Fiennes on what attracts him to Coriolanus or Julie Taymor on directing her film adaptation of The Tempest. Most of the material is original, some of it reprinted but the overall effect is similar to some of this blog's annual reviews. Providing a group of people with a slightly nebulous open topic and telling them to run with it and see where it takes them. Some offer a couple of pages, others more than twenty. Inevitably the results are a bit of a mixed bag. Certainly the best piece are when the writers have stuck to the brief and write about how Shakespeare has effected them directly, the process of thinking through a performance either in a role or directing with behind the scenes anecdotes, underscoring that these are plays to be watched more than read. F Murray Abraham's meditation on Shylock is perfectly structured around the challenges of staging the play in numerous venues and how his interpretation changed depending on the communication possibilities of the space. Jess Winfield of the Reduced Shakespeare company compares the revision process of his show with Will's own. Unfortunately, there's also a tendency to shift into a much more generic academic approach, with articles indivisible to what might be found in a traditional literary criticism publication of the kind which is only truly interesting if the reader is actually studying a given play and not simply seeking passing inspiration. Oddly, a few of these are provided by actors, who begin with some explanation as to why they're covering the topic, usually that they played the role in some old production, before heading off into something which seems to be allowing them to write the essay which might have eluded them during their university career. Not that there aren't some exceptions. James Earl Jones's The Sun God which investigates tragedy in general and particularly Lear and Othello offers an approach I'd not previously encountered, that if you blame others for their failures as is the tendency in those plays, you're diminishing their own role in the chaos. Iago is racist and persuasive, true, but its Othello's own failings as a human being which lead to his destruction. Rory Kinear considers the flexibility which Shakespeare's texts provide and how much of what we see is based on the rehearsal process and the audience's interpretation than what appears in the actual text. A few outrages. Germaine Greer's otherwise quite logical argument that Shakespeare must have visited Stratford regularly during the quarter of a century he was otherwise in London then continues by suggesting this as a reason why he can't have collaborated with any other writers, singling Pericles out as a solo work even though anyone whose read or seen the play can tell full well that he clearly takes over after act two as the intellectual quality of verse increases ten fold. There's a reason why there's been less writing on Shakespeare potentially being the sole author of the plays -- it's because the evidence stacks up against it. He can only be the sole author if he's deliberately pastiching the style of another writer in places. In her introduction, editor Susannah Carson says she hopes the essays will act as a conversation, which she facilitates by grouping them around loose topics, either plays or themes or modes of production. There's some repetition, with R&J's balcony scenes being investigated from numerous angles. Reading the book cover to cover was probably a mistake. This is the sort of thing to be dipped into, perhaps around watching the plays. Almost all of the writers acknowledge that it wasn't until they saw the text into production that they really became fans of the plays and perhaps that's the best message the book can offer. The Love Actually Sequel is for charity. Film As you will have noticed from the many click bait articles which have slipstreamed in its stead containing what amount to a synopsis and screenshots for people without the patience to sit through ten minutes of moving images with sound, a Love Actually sequel was broadcast during this year's Comic Relief. I did not watch Comic Relief. Comic Relief stopped actually being comic relief many years ago when budgets were clearly cut and many of the comedians I actually liked retired in favour of the kinds of people who turn up on comedy panel shows. Oh and when paradoxically they stopped doing special versions of comedy panel shows. But I did dip in after seeing High Plains Drifter for the Love Actually sequel if only so that I wasn't going to be spoilt by the many click bait articles which have slipstreamed in its stead containing what amount to a synopsis and screenshots. Perhaps it would provide an magical epilogue to the original monstrosity with the ability to retrospectively nullify some of its crimes. In the event, caught between homage, parody and straight sequel and shot in a televisual style on 16:9 digi-cameras, well, no, no it didn't. The moment at the end of the making of documentary on the Spaced dvd which showed what happened next for Tim and Daisy was more relevant and essential. Yet it feels like I should provide some analysis, not least because thanks to discovering the joy of reading and binging on Star Trek, this blog has lately become without form and void just as I feared it might do at some point. Linking to the same bloody film review and old blog posts on Twitter isn't the same thing. To provide some structure I'll reuse some of the subject headings from that same bloody film review even though most of them probably won't fit. There's not a lot you can do with a ten minute piece. On the upside, unlike the content of that original post, I don't have the final mark for a post-graduate degree counting on it being coherent. It’s not a romantic comedy. Still isn't. One of the inherent problems with sequels to romantic comedies is that narrative unity has already been fulfilled first time around. That's why there tends to be so few of them, there's nothing less amusing than watching the same couple fall in love again. That's why they generally seek to focus on some other couple who're related to the main characters from the original film, as per This is 40 or My Big Fat Greek Wedding II. The reason the Before ... trilogy works is because the first film didn't provide a solid ending, there was a moment of doubt, something which could be picked up later in the unplanned sequel. Love Actually again isn't trying to be a rom-com in the strictest sense, setting itself up to follow the pattern of Richard Linklater's films and the Cold Feet revival. What are these beloved characters doing now? As with both those examples, in the answer in this text is getting old, although with the slim running time there precious little space to enter into any profound discussions about the implications of ageing. About as close as the script comes to such is Liam Neeson's Daniel acting like a Outbin clicker "You won't believe how old your son looks now ..."
Though it's noticeable that all of the original film's featured hetro couples are still together after fourteen years. The huge mistep is in killing off Gregor Fisher's manager character offscreen and in an offhand comic way. His ambiguous relationship with Bill Nighy's Billy Mac was one of the film's few truly poignant moments and to plop that revelation into the middle of this seems ill advised and somewhat ruins the conclusion of that storyline depending on how canonical you consider this sequel to be. There'll be fan arguments on discussion boards for years to come. "But it was for charity and featured the Eastenders!" "Yes, but it's the Rani's third tv appearance!" That sort of thing. Arguable. Mainly a series of sketches, there is some motioning towards the structure of the original film with some cross cutting between some characters single scenes and the sections featuring Hugh's PM and Atkinson's angel (or whatever he's supposed to be). But there's no sense of time. Is the car ride between Jamie and Aurelia supposed to happening while the shop assistant is filling the bag or are we supposed to assume that they're disembodied sketches, the cross cutting between mirroring the approach used frequently in The League of Gentlemen or The Fast Show? Presumably the idea is to create an increased longevity to that shop scene but the point of the scene in the original film, other than providing levity to a moment about a man buying a present for his potential mistress, was that due to the longevity, the audience, like Alan Rickman's character was stuck in that moment watching the shenanigans as they pressed on and on and on. Cutting away here kills the joke stone dead. Not that it was especially funny to begin with due to the lack of surprises. Especially when Curtis cut to the massive queue outside. Didn't see that coming. At all. Quadruply true here. Imagine if you'd been lucky enough to have never seen Love Actually before watching what amounts to a series of callbacks to (admittedly for some) beloved scenes. None of it really makes any sense and only goes to highlight as I indicated in the original review, just how much they're simply playing versions of the kinds of roles they've played elsewhere. It's also notable that most of the male actors in here haven't changed the kinds of roles they play that much in the meantime. Most of them have simply shifted into more character rather than leading men roles, with the exception of Liam Neeson who has become an all the skills action hero something none of us expected. I miss the man who made Kinsey. It’s less funny and even a bit creepy the second time around. Good god, the Andrew Lincoln section makes that original storyline even worse. Now we can watch the original film safe in the knowledge that stalkery Mark is going to return in fourteen years to essentially shame Juliet for not choosing him in the first place and then boasting that he's married Kate Moss. Who actually turns up so she can be part of the reveal. I appreciate this is supposed to be funny and charming and a homage to the Claudia Schiffer cameo in the original film and has a metafictional element in which the idiot boards talk the viewer but the fact that Richard Curtis still doesn't get why all of this is horrendous, unfunny, creepy and sinister does him no credit. In this month Empire, during an interview with Paul Feig he even mentions someone calling this the "the stalker scene" to his face. He knows. He knows. And yet here we are again. It’s about middle class white men seducing their employees. This sequel only goes to remind us of this and even uses their change of status as a source of humour. "I liked you best when you worked for me" he says. Christ. Oh how they must reminisce. "Remember when I used to pay you a salary?" There's no indication as to whether Aurelia has her own job now and without much more evidence it's not fair of me to speculate. But that is a lot of children. Hopefully they share the caring duties. Nearly all of the men are creeps anyway. Fucks sake Jamie haven't you learnt Portugese yet? You've been married to her for over a decade and her English is amazing. Your children know the language better than you do. I appreciate this was the point of that scene and writing is hard and finding something new to do with this couple was probably tough but it makes Jamie look even more foolish than he did in the original film and that's saying something. Admittedly that's not creepy in the Mark sense, but another definition is "slow steady movement, especially when imperceptible" which seems to fit the bill here. The only two “main” female characters have unhappy endings. Almost all of the female characters are still in supporting roles and used to create a moment of surprise, Natalie bursting in on her husband dancing, Kate Moss's cameo and Joanna's reveal (It literally is "Here's Love Actually's Olivia Olsen all grown up! Photos on pages 3, 4 & 8"). Incidentally, in that same EMPIRE interview, Richard Curtis says the Laura Linney storyline from the first film is something he's most proud of. He still doesn't get it, even now. Assuming they’re main characters at all. The one exception is Aurelia who has one of the longer speeches and funniest reactions in the piece (making Jamie's lack of language skills somewhat forgivable). A glance at the IMDb indicates Lúcia Moniz has been in solid work on Portugese television since 2003. Good for her. It has a stunning lack of diversity. Still somewhat true in a lead character sense due to the casting choices from the original film. Chiwetel Ejiofor remains on the sidelines. Gregor Fisher's potentially gay character has been killed off. But the supporting cast is exceedingly diverse, notably the boy who acts as straight person for Atkinson's antics and the press pack in the press conference at number 10, although that is still overwhelmingly white (probably simply reflecting the industry more than anything given how many of the people in the crowd were invited from actual news organisations). (1) "And Piers Morgan's still alive." Oh burn and the only genuinely laugh out loud funny moment due to its audacity. Morgan spent Comic Relief Day in a vow of silence. I wonder if that broke when he sat watching this and heard that comment. It's amazing he wasn't straight on Twitter saying nasty things about Hacked Off again or whatever. (2) Hugh's final speech, which he plays beautifully, recalling his superb performance in Curse of the Fatal Death. Curtis knows how to write this stuff still at least and the message, as Mark Kermode also says, that everything is going to be alright in the end, is just the sort of thing we all need to hear right now. Plus the Elf joke which I'm sure pleased Gary Bainbridge who hates that film just as much as I hate Love Actually. There was a time when I adored Love Actually, before having to take it apart frame by frame for my dissertation and I'd be lying if I didn't say that there was something Proustian about revisiting these characters or that re-hearing the Shakespeare in Love theme at the end didn't make me sigh. Some people still love this film and I can't hold that against them. Indeed this almost made me want to go back and watch it again after ten years. Perhaps I'm just afraid I'll like it too. My Favourite Film of 1906. Film After last week’s early sound experiment, here’s a colour filmmaking system from 1906. George Albert Smith’s documentary Tartans of Scottish Clans is mostly simply that, shots of tartan patterns with their identifying labels, with a last minute twist. Smith is utilising a two colour process he invented. Kinemacolor projects a black and white image behind alternating red and green filters. The Wikipedia page has a more detailed explanation along with further examples.